Hebrew newspaper in Laurel & Hardy's Blotto? 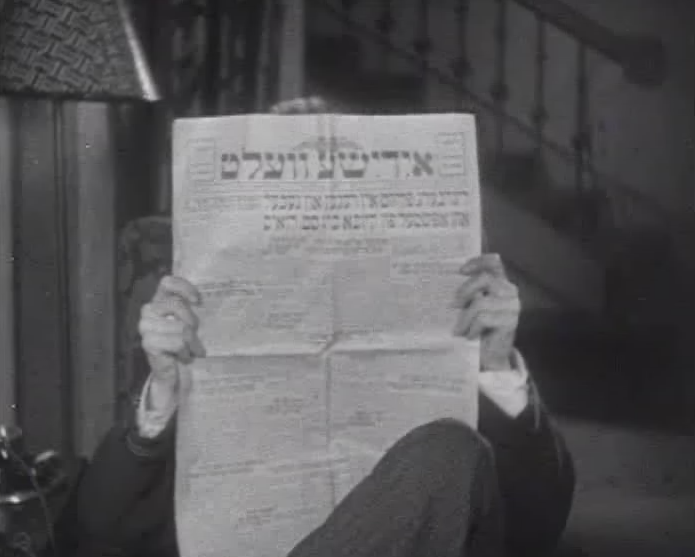 In the Laurel & Hardy movie (or episode, if you will) Blotto (1930), in the first scene, Stan is reading a hebrew newspaper. So I was wondering, why a hebrew newspaper? Is there any reason and purpose for this, or has it got any meaning? I couldn't spot anything in the movie that this is a reference to or anything... I can guess it's some sort of a 'random' joke that really doesn't have a special meaning or purpose, yet I'm eager to find out if this is the case. I think the joke is that he is presumed not to be able to read Hebrew, so this signifies that he is only pretending to read the newspaper. It could have been any other language, but one which uses a different alphabet makes it more obvious, and it may be that at the time the only choices most Americans would recognize would be Hebrew and possibly Russian, although since this is pre-Cold War, even that might be a stretch. This is not a hebrew newspaper but a yiddish newspaper "Yiddishe Velt", (Yiddish World). Yiddish can be written in either hebrew or latin characters. In the first half of the 20th Century there were many yiddish newspapers in the USA catering to the large jewish immigrant community. There was also a very active yiddish film industry in the USA and Europe. This could be an 'in joke' between the cast and crew, or just an interesting accident. Incidentally, Laurel and Hardy were (and are) very popular with jewish audiences; in hebrew they are known as "Hashamen v' he razeh", literally "the fat one and the thin one". It was typical at the time to film movies in more than one language. Blotto was simultaneously filmed in French and Spanish. Anita Garvin, who plays Stan's wife, is replaced by Spanish and French actresses in those versions of the film. Perhaps the choice of newspaper was an attempt to find a visual joke that would work in more than one country. One of McCarey's first projects as production supervisor was to develop a series of Max Davidson comedies. Somehow, McCarey's Irish heritage helped him see the possibilities for Jewish humor surrounding Max Davidson as a beseiged, henpecked husband at the mercy of his family. And what a family. Rich in visual gags and situational humor, the Max Davidson comedies written, supervised, or directed by Leo McCarey remain among the funniest - and also the most unsung - of all silent short subject films. Born in Berlin, Max Davidson's brief series ended only when ethnic humor temporarily fell out of favour. One reason it fell out of favour was quite simply that the Jews who ran Hollywood were embarrassed by what they considered to be stereotypes. Seen even today, the little comedian's material is basically inoffensive and quite restrained. The suggestion is that his wife is Jewish. There is an old stereotype of Jewish wives being, well, bitchy. Basic logic objectively would indeed assume that if a Hebrew or Yiddish newspaper was a household item laying casually in the home portrayed there as the Laurel's, & that the paper seemed not useful to Mr. Laurel, then the other spouse, Mrs. Laurel, would seem to have need of it to be in their house, i.e. her being the Yiddish/Jewish family member in the home. Good stuff, Maynard. Not the answer you're looking for? Browse other questions tagged props laurel-and-hardy blotto . What is the significance of newspaper shot in Stranger Things S02E01?